The CEO pay debate inside the SEC’s Washington, D.C. headquarters last week generated wild rhetoric — and a solid step toward CEO pay transparency. Watching grown men fulminate in public can be an unnerving experience. Michael Piwowar and Daniel Gallagher — two distinctly CEO-friendly members of the five-person federal Securities and Exchange Commission — did plenty of fulminating last week. Piwowar and Gallagher had little choice. They were trying to defend the indefensible — the skyrocketing pay of America’s top CEOs — against a common-sense reform that lawmakers wrote into federal law three years ago. That law, the Dodd-Frank Act, mandates that corporations annually reveal the ratio between what they pay their top executives and what they pay their median, or most typical, worker. Mandates like this don’t just automatically go into effect when a bill becomes law. Federal regulatory agencies have to draw up rules that spell out how any new mandate will be enforced. SEC regulators began the rule making for pay ratio disclosure — Dodd-Frank’s section 953(b) — soon after the legislation’s passage. But intensely hostile corporate pressure quickly bogged the rule-making process down. Last Wednesday, after 37 months of frustrating delay, a pay ratio disclosure rule finally came up for formal SEC consideration. In the hour-long debate on the proposal, commissioners Piwowar and Gallagher both did their best — and then some — to channel Corporate America’s fierce hostility to CEO pay transparency. After 37 months of delay, a pay ratio disclosure rule has finally come up for formal SEC consideration. Gallagher labeled Dodd-Frank’s 953(b) a “rotten mandate.” Ratio disclosure, Piwowar ranted, would “unambiguously harm investors.” Complying with the “complexity” of the disclosure mandate, they both charged, would impose unconscionably huge new cost burdens on America’s corporations. But the new rule brought before last Wednesday’s open SEC meeting actually simplifies compliance, as even leading corporate pay consultants acknowledge. The rule lets corporations identify their own median worker — that employee who makes more than half a company’s employees and less than the other half — in any reasonable way they choose. Large corporations with hundreds of thousands of workers, for instance, don’t have to plug every individual worker’s compensation into a spreadsheet to compute a median. They can use the same sort of statistical sampling techniques that corporations use routinely on other data-gathering fronts. What corporations can’t do under the proposed new rule: exclude part-time or seasonal or overseas workers from their median pay calculations. The new rule SEC staff presented requires firms to take into account all their workers, from every subsidiary, foreign and domestic. In real economic life, ‘zero economic benefit’ comes from a corporate pay system that has CEOs grabbing hundreds of times more compensation than their workers. In real economic life, of course, the “zero economic benefit” comes from a corporate pay system that has CEOs grabbing hundreds of times more compensation than their workers. Employee productivity, morale, and loyalty all suffer, as AFL-CIO president Richard Trumka pointed out last week, whenever top execs skim off “the lion’s share” of a company’s compensation. Companies that share their rewards more equitably, by contrast, send the message that all employees matter, a message that helps nurture more committed and innovative workforces. Piwowar and Gallagher dismiss groups like CalPERS, America’s largest public pension fund, as “special interests” out to “name and shame” America’s noble corps of corporate chief executives. 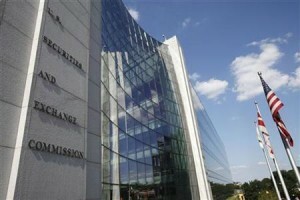 Piwowar objects to the SEC “even considering” a rule on CEO-worker pay ratio disclosure. But commissioners Piwowar and Gallagher would find themselves on the short end at last week’s SEC session. The pending CEO-worker pay disclosure proposed rule passed, 3-2, when SEC chair Mary Jo White called for a vote. The new proposed SEC rule now faces one more hurdle: a 60-day period for public comment that leads into a final SEC vote. Corporations will no doubt flood the public comment period with predictions of doom and gloom should ratio disclosure go into effect. Corporations will no doubt flood the public comment period with predictions of doom and gloom should ratio disclosure go into effect. Corporate groups are also pressing Congress to repeal the original Dodd-Frank disclosure mandate, and they may even go to court to stop ratio disclosure from going into effect. Why all this corporate pushback? Institute for Policy Studies analyst Sarah Anderson put the matter clearly just before the SEC vote. With annual disclosure, investors, consumers, and workers would be able — for the first time ever — to compare individual corporations by their level of CEO greed and grasping. Execs pulling in hundreds of times what their workers make would have to explain why other firms can thrive with much narrower pay gaps. But ratio disclosure could produce far more than embarrassment for overpaid execs. Lawmakers could build consequences onto the information that pay ratio disclosure unearths. They could, for instance, deny government contracts to firms that pay their CEOs over 50 or 25 times what their workers are making. Back in the 1950s, America’s CEOs averaged just 25 times average U.S. worker pay. A Bloomberg News survey this past spring found eight CEOs making over 1,000 times the average pay of workers in their industry. Pay ratio disclosure — by individual firm — won’t by itself take us back to more reasonable corporate pay patterns. But this disclosure could turn the corporate pay tide. And for America to ever become more equal, that tide must turn.